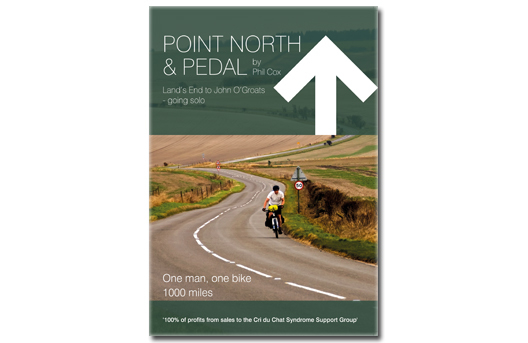 Home / Bike Training / Re-Launch of Point North & Pedal – Get your FREE Kindle copy now! 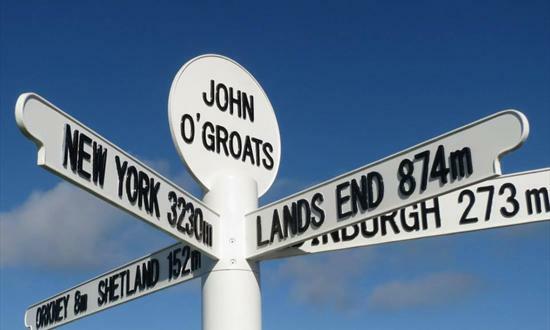 I’ve learned a lot about self-publication since launching Point North & Pedal in 2013, a book about my experience of riding nearly 1,000 miles from Land’s End to John O’Groats. Sales have been OK but I thought I would apply some of this new-found knowledge to re-launching the book. I’ve read a lot of blogs and listened to countless videos about the best way to promote a book, hopefully some of it has rubbed off! So, what’s it all about and what’s the point? I rode the UK End to End in 12 days, a solo effort on a heavy mountain bike but it had a clear purpose, raise lots of money for the Cri Du Chat Syndrome Support Group. I was a fairly new to riding a bike at the time but made sure I practiced everything I would need to ride an average of 80 miles a day for nearly two weeks. It was one of the most amazing experiences of my life, I can’t recommend it enough. The book is an amusing look at the physical and mental side of taking on such a ride. It’s supposed to be funny but also inspirational, something I hope comes across to the reader. I have been honest about how I felt, especially regarding the severe homesickness, something I have never suffered from in the past. I have also resurrected the word ‘wassock’, a very satisfying term when applied to people who wind me up. I originally wrote up my notes purely as a personal project, as I got into the detail, it became steadily more fascinating. I had always planned to write something when I got back so I maintained a meticulous journal during the ride. It was a positive way to spend the evenings once all the ‘housekeeping’ had been sorted out. I had a lot of thinking time, usually in a freezing tent and isolated from the rest of my life. The book also developed into a ‘top tips’ guide for those looking to research the ride, I made plenty of mistakes so I hope prospective LEJOGers will find some useful information. Check out the About section of this web site for further tips and kit reviews etc. The end result should have something for everyone, it’s not just for cyclists or those interested in touring on a bike, it’s a story too. All the above sounds very self-indulgent but there was a point to the exercise, I sell the book to profit the Cri Du Chat Syndrome Support Group. They are a great (small) charity that supports families of those with CDC Syndrome, they also fund research into this rare chromosomal disorder. I have a personal connection with the charity so raising money for them seemed a natural thing to do. To date, the figure stands at over £7,600 but I can and must do better! So, moving into 2016, I am offering the book for FREE for a limited period of 5 days only! A little counter intuitive but I hope to improve future sales as a result; more people see what I have done and talk about it to their friends etc. If you have a Kindle, please DOWNLOAD the book – after all, it’s FREE! If you don’t have a Kindle, you can down load reading apps for most devices. Like my Facebook Page (there is also a ‘Like’ button in this blog, under the Twitter feed on the right). If you read/have read the book, write a review on Amazon, this really helps to drive sales. If you don’t have a Kindle, buy a paperback copy (they make great presents too!). You may own a copy already, if that’s the case, thank you for helping to raise a little more cash for the charity. It all adds up and makes a difference. More information about the charity can be found here. Here’s to a great 2016, whatever you are doing.